My brother and nephew sent me pictures of their Christmas and of their trip to see us in December so I decided to try my hand at this project. 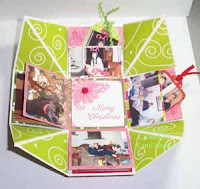 I used my Scor-Pal and Merry Wishes cardstock collection, and the Brights Cardstock Stack. I got the template from the Scor-Pal website. I used the following stamp sets: Flourishes, Fancy Curls, Calendar, Simple-Bet, and Trendy Greetings. I also used Palette Hybrid Inks (pg.119 of our Inspiration Book), Assorted Bitty Blossums, a large red brad, and various ribbons. I showed it to my mom and she promptly asked to have it! I was thinking of giving it to my brother but he'll just have to come a visit to see it! This is rather small (9"x9") but is still cute. I think next time I'll do a 12"x12" so I can use larger photos. I used 18 photos (1 in the cover) so try to figure out where they all are! To see this closed with the cover you need to go to my personal website and look in the Misc. Album in the gallery! Love your samples on the blog so far...looks great!! You always have such great ideas & techniques. I'm looking forward to more posts! I really like the horse card, especially with that saying...just perfect!! I'll have to check out the Scor-pal site for that "scrapbook in a box" template.